All the activities and results achieved during first year of ERN-EuroBloodNet implementation are gathered in its first annual report. The report is going to be distributed during EHA Annual Congress in Stockholm. The European Reference Network – EuroBloodNet covers all Rare Haematological Diseases (RHD) both non-oncological and oncological. During its first year, important efforts from the coordination team have been focused on setting up the structure to ensure that all its 66 members become active participants. Some of its initiatives have been the implementation of the ERN-EuroBloodNet website and the production of dissemination material to spread the word of ERN-EuroBloodNet, including powerpoint, poster, leaflets and flyers. Based on common unmet needs to all Rare Haematological Diseases identified during the 1st year of the network, the activities carried out were focused on mapping the existing expertise, services and facilities available across all its 66 ERN-EuroBloodNet Members as a starting point for further work in the future. In addition, ERNEuroBloodNet has contributed to the pilot testing and promotion of the Clinical Patient Management System, the telemedicine platform for inter-professional consultation for the safe sharing of clinical data. Learn more in EuroBloodNet First Annual Report. EuroBloodNet recognises the key role that patient organisations have in healthcare. They help patients and their carers to understand their condition, to find out about how and where to get access to the best treatment and care, to learn how to live with the disease, its symptoms and side effects, and help them to navigate their healthcare systems to achieve best possible outcomes. The MDS Alliance is proud to be part of EuroBloodNet and represent the voice of MDS Patients across Europe. At the third conference on European Reference Networks (ERNs) in Vilnius, Lithuania, EuroBloodNet was officially awarded as one of the recently approved ERNs. ERNs is an initiative of the European Commission and consist of networks of healthcare providers and centers of excellence in Europe aimed at improving quality, safety, and access to highly specialised healthcare. Through these networks, healthcare providers have access to a much larger knowledge pool and patients have better changes to receive the best treatment. 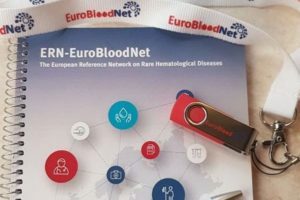 EuroBloodNet, the ERN on rare hematological diseases, results from joint efforts of the European Hematology Asssociation (EHA), and the European Network for Rare Congenital Anemias (ENERCA). It is coordinated by Prof. Pierre Fenaux from the Hopital Saint Louis , Paris, together with Prof. Béatrice Gulbis from the University Hospital Erasme, Brussels. The network brings together 66 highly specialized hospital centres with expertise on malignant and non-malignant rare hematological diseases. Patient involvement is key in ERNs. For EuroBloodNet, the hematology patient community elected five representatives: Amanda Bok (European Haemophilia Consortium), Angelo Loris Brunetta (Associazione Ligure Thalassemici Onlus), Jan Geissler (Leukemia Patient Advocates Foundation), Ananda Plate (Myeloma Patients Europe) and Sophie Wintrich (MDS UK Patient Support Group) successfully ensured that the patient voice is fully represented in the ERN Board and sub-clinical committees – a great achievement and milestone in increasing the role of patients in clinical care as it evolves in Europe.